The mainstreaming of augmented reality won't happen overnight, but it's becoming increasingly clear that traditional media is leading the charge in the effort to introduce the public to immersive computing. A recent example came from none other than USA Today via its 321 Launch app. Back in March, the media company teamed up with Florida Today to allow their readers to immersively experience real space launches from the comfort of their homes, and now the makers of the app are revealing just how well the app did in terms of reader engagement. According to the Florida Today team, the app has garnered roughly 100,000 downloads during its relatively short life, an impressive number when you consider that the app doesn't involve catching virtual monsters and is instead focused on education and news. Among those users, the app has managed to snag the coveted millennial demographic, with about 48% of the app's downloaders coming from the 18- to 34-year-old range. "We were looking at Pokèmon GO and how that used real settings and augmented reality, and just doing discussions about what we could do that freshens up our launch coverage," said Mara Bellaby, Florida Today's new director, in an interview with Northeastern University's School of Journalism blog StoryBench on Wednesday. "As a parent of a 9-year-old son, I see how he uses technology like this, how it's natural for him, and how it's expected," said Bellaby. "We still do our print newspaper, we're digital, but I think this is an important thing to give us a foothold on how things quite possibly will be, and to raise our flag out there on a new way of doing things." We are thinking beyond the rocket and this one app – about how we are going to use augmented reality and virtual reality and other emerging technologies to tell our stories. But just because the two organizations had initial success with the app, that doesn't mean they're content to sit back and simply hope for more downloads. Earlier this month, USA Today doubled down on its AR initiative by integrating the 321 Launch app experience into its own USA Today app. "We've been bringing new storytelling experiences to our audience, and allowing them to engage with our content in new ways through new interactives, virtual reality, and now augmented reality," said Ray Soto, USA Today's director of emerging technology. "We've seen strong engagement within 321 Launch, and now want to share that experience with our USA Today mobile app users." For those looking to skip the general news content and focus on the space experiences, the app, which allows users to view AR versions of launches from SpaceX and the United Launch Alliance, is available for both iOS and Android. "As far as the space industry goes, some of the people I've spoken to who work for SpaceX or Boeing don't have apps like this," said Emre Kelly, a space reporter for Florida Today. "Maybe in the future they can use augmented reality as a tool for their engineers or for people actually working on the rockets. Augmented reality technology is already on the International Space Station. It can teach skills that they don't have, like how to fix a computer. 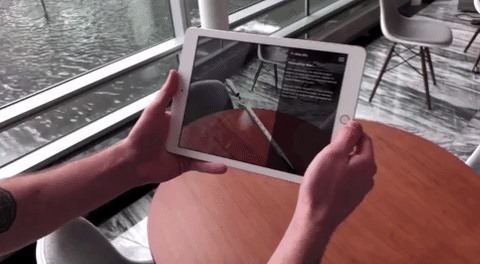 If they don't know what they are looking at, augmented reality can help them."